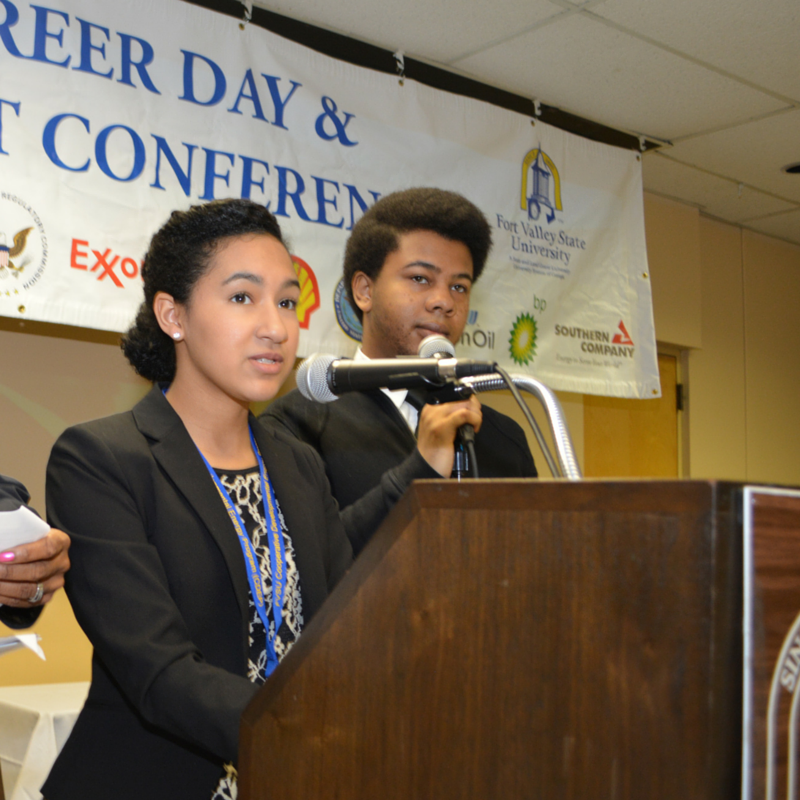 February 17, 2016 – Fort Valley State University will award more than $300,000 in scholarships during its 33rd Annual Energy Career Day and Student Recruitment Conference, Feb. 21-23. The highlight of the conference will take place on Monday, Feb. 22 during its Scholarship Awards Luncheon at 11:15 a.m. in the C. W. Pettigrew Center. The program will award several high school students full ride scholarships valued at $50,000 each to attend FVSU. The university’s Cooperative Developmental Energy Program is a one-of-a-kind program at FVSU. It was created by Dr. Isaac J. Crumbly, FVSU’s associate vice president for career and collaborative programs. The program encourages academically talented minority and female students that excel in science, technology, engineering and mathematics (STEM) areas to pursue careers in the energy industry. During the past 20 years, CDEP has awarded more than $10 million in scholarships to students. During the luncheon, representatives from the oil industry and government, state legislators, CDEP scholarship recipients and alumni, and FVSU faculty and staff will be in attendance. Some of the major energy companies that have financially supported the program over the past five years include Aera Energy, AGL Resources, BP, the Bureau of Ocean and Energy Management, the Bureau of Safety and Environmental Enforcement, Chesapeake Energy, Chevron Energy, Chevron Corporation, the Department of Defense,the Department of Energy, ExxonMobil, Marathon Oil, Shell, the Southern Company, the Thurgood Marshall College Fund, the U.S. Nuclear Regulatory Commission and the U.S. Geological Survey. On Sunday, Feb. 21, the program will host an Industry Awards Banquet at 7:30 p.m. in the C. W. Pettigrew Center to honor the recipients of the program. This year, the organization will honor three winners. Johnny C. Taylor Jr., president and Chief Executive Officer of the Thurgood Marshall College Fund, will receive the Platinum Achievement Award. ExxonMobil Geologist and National Association of Black Association of Black Geoscientists President Jerome Murphy will receive the CDEP Alumnus of the Year Award. Walter Jones, who is a Chevron Geologist-Land Team Lead of the Piceance Basin Assets, will receive the CDEP Service Award. CDEP and its partnering schools have graduated 93 engineers, 33 geoscientists and eight health physicists. The partner institutions include Georgia Institution of Technology, Pennsylvania State University, University of Arkansas, University of Nevada, Las Vegas, University of Texas-Austin, the University of Texas-Rio Grande Valley. For more information, contact CDEP at (478) 825-6243.